Charles Albert Rowland was born in Yeovil during January 1881. He was the eldest of the three children of currier William Rowland (1857-1936) and Harriet nee Fox (1849-1899). In the 1881 census, William, Harriet and 3-month old Charles were listed at 10 Chant's Path. The family were still in Chant's Path in the 1891 census but the family had grown to include Ernest (b1884) and Florence (b1887). By 1901 the family had moved to Beer Street. 20-year old Charles was a house painter. In the winter of 1917 Charles married Kate Brown at Yeovil. They set up home at 53 Hendford but it is quite likely that Charles enlisted shortly after his marriage. Charles enlisted in Yeovil although the exact date is unknown. He enlisted in the Royal Field Artillery as a Gunner. His Service Number was 135315 indicating that he enlisted later in the war, probably during late 1917. He joined 'B' Battery, 155th Brigade, Royal Field Artillery. Sadly there is very little information on this brigade. It would most likely originally comprised of A, B, C and D Batteries RFA and the Brigade Ammunition Column. It was initially placed under command of the 31st Division and later, in January 1916, joined 32nd Division. The batteries were all armed with four 18-pounder field guns. In January 1917 the 155th Brigade left 32nd Division to become an Army Brigade. At this time many RFA Brigades were detached from Divisions and placed under orders of higher formations. From this point they were known as Army Brigades. This change in command and organisational structure affected regular, Territorial and New Army units alike. Although it is difficult to pinpoint the exact whereabouts of Charles and the 155th Brigade, it is almost certain that 155th Brigade was involved in the Third Battle of Albert (21-23 August 1918). This battle was significant in that it was the opening push that would lead to the Second Battle of the Somme. This attack opened the advance, with the main attack being launched by the Third Army along with support from the Fourth Army. The attacks developed into an advance, which pushed the German 2nd Army back along a 50-mile (80 km) front line. On 22 August, the 18th (Eastern) Division took Albert, with the British and Americans advancing on Arras. The Second Battle of the Somme of 1918 was fought on the Western Front from late August to early September 1918, in the basin of the River Somme. It was part of a series of successful counter-offensives in response to the German Spring Offensive, after a pause for redeployment and supply. 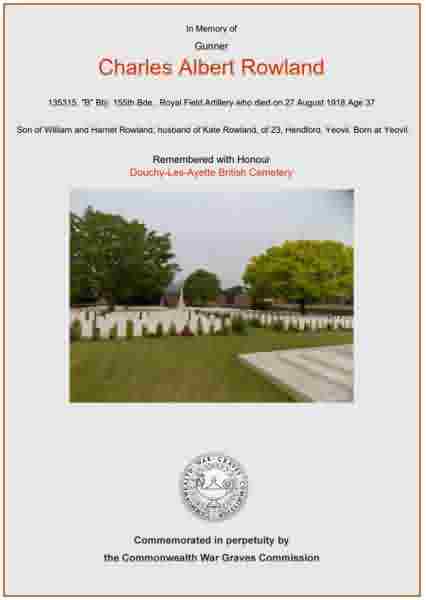 Charles Rowland was killed in action on 28 August 1918. He was aged 37. In its edition of 11 October 1918, the Western Gazette reported "Mrs C Rowland of 53 Hendford, whose husband, Gunner C Rowland was killed in the recent fighting France has received a letter from an Army Chaplain, in which he states that Gunner Rowland was buried near the village of Hamlincourt, near Arras. He assured Mrs Rowland that she had the pride of knowing that her husband had died a brave man’s death for his King and country and that a cross marks the grave where he lies. The late Gunner Rowland was a well-known member of the Church Army and the Adult School." Charles was interred in Douchy-Les-Ayette British Cemetery, Pas de Calais, France - Grave I.C.3 - and his name is recorded on the War Memorial in the Borough. The Commonwealth War Graves Commission certificate commemorating Charles Rowland.